Retro platformer with a unique twist: you can push obstacles out of the way! Create your own levels or play any of the 1000's of player created levels. A push the blocks game that everyone can play......don't get stuck! Neverending Pong brings back all the emotions of old arcade video games. Everybody can play this game, but who will be the World Champion? 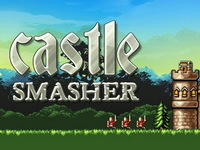 Features: single and multiplayer (same keyboard) games, many characters and game field to choose! Use various weapons to fight genetically modified vegetables! Fight the salad or become one!